When HSBC announced the opening of its 2011 survey, Smart Insights‘ Dave Chaffey posted an insightful interview with Lisa Wood, Head of Marketing at HSBC Bank International. The survey was devised because as a business we wanted to better understand the expat community and the issues and challenges they face whilst living or relocating overseas. Expat Explorer has provided us with some fascinating insights and because it covers all aspects of expat life has allowed us to better tailor the services we offer to our existing and potential customer base. Don’t write off branding activities that don’t directly generate sales. The goal behind the Expat Explorer Survey was originally to prove to expats that HSBC understands their needs, Wood said. But since the survey generates a great deal of press attention it has also driven a lot of traffic to the HSBC website at no additional cost. “We are investing in compelling content designed to pull people into the website, as opposed to spending money to ‘push’ people to us,” she explained. Keep social media personable. HSBC uses its Twitter and Facebook accounts to interact directly with followers–the human quality of the interaction lends more credibility to the campaign itself. Value outweighs PR-speak. Perhaps the most important takeaway from the Expat Explorer Survey is that creating a value-added product is a far more effective marketing device than flashy PR-language. The former proves a firm has expertise, the latter merely says it does. The reason HSBC’s survey generates so much media attention is that it’s a generally useful tool for understanding trends among expats worldwide, not just a mouthpiece for HSBC’s marketing department. 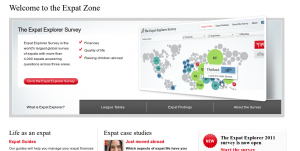 HSBC’s Expat Explorer is a model expat campaign in that it makes use of new media, builds both brand recognition and credibility and drives web traffic, all at a relatively fixed cost. The up-front investment in conducting the survey is therefore returned many times over each year in terms of media coverage and overall visibility. Posted in Expat PR.Tagged Expat Explorer, HSBC.